Experience a whole new side of Galactic Civilizations III with the Crusade expansion! Discover your enemy's weak points with espionage, actively invade and conquer planets, and help talented citizens rise to power and drive your civilization into a golden age. 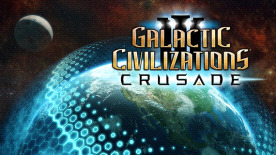 With a detailed civilization builder tool for Steam workshop, espionage, revamped invasions, Galactic Citizens system, new races and civilizations, and more, Crusade adds a host of depth for Galactic Civilizations III that players have been craving. Shape the course of your civilization's destiny with talented individuals called citizens. Choose from over a dozen unique roles - commander, engineer, farmer, celebrity, and more - to help your colonies flourish by unlocking new gameplay or providing bonuses. The unique Promotions system allows citizens to answer a higher calling. They become effectively "consumed" for a large benefit. Commanders can become Privateers and convert their ship into a powerful vessel that belongs to no civilization and terrorizes other ships for fun, profit, and plausible deniability. Celebrities can sing their swan song in a spectacular final concert, Spies can choose to go down in a blaze of glory (and explosives!) as Saboteurs, and more. • Terran Resistance: The portion of humanity that avoided being trapped on Earth behind the Precursor Shield, years on the run have made them resourceful, but hard. • The Onyx Hive: These multi-limbed worms were born from the deep, volcanic vents in the ocean of their homeworld. Natural spies, their society thrives on backstabbing and intrigue. • The Slyne: These cybernetic space amoebas look down on other races as being primitive. Fickle and hard to kill, it's probably best to stay on their good side. Think you know how the Drengin operate or what kind of trades the Krynn might expect from you? The races you were once familiar with have all been changed so that playing against them is a more unique experience. When you go to select opponents for a map, a whole new host of information is available to you now so that you can make a better decision about who you'd like to play against. All of the races value different resources, ideologies, and more, so each experience you have will be unique! Overall re-balancing and pacing changes keep the early game chock-full of interesting and important choices that you need to make for your civilization. The economy makes it so that each choice impacts what options you have available to you later - will you build a shipyard first, or will you establish a Central Bank in order to boost your income early on? Trading is critical in Crusade because you need to obtain and amass resources in order to do things. A "trade bar" now shows up above the dialogue box and shows how fair the trade is and how much further you'll have to go before your trade partner accepts your proposal. Races will value resources differently based on how much money they have, whether they like you or not, and dozens of other factors. The re-balancing done on the Alliances system will make you think twice about going back on your word or attacking certain civilizations. There are very real consequences for "war mongering" or for breaking an alliance or treaty - not only will the offended civilization come for blood, but now they'll be bringing all their friends and allies, too. Crusade also features a sleek, functional new UI. Multi-core pathfinding keeps turns short and quick, even in late games with dozens of civilizations on massive maps. Crusade is packed with new features and improvements that are both accessible to new fans and exciting for long-time players of Galactic Civilizations III.